One of the biggest threats to cities around the world is sea-level rise, caused by the expansion of water at higher temperatures and melting ice sheets on the north and south poles. Recent studies by the NOAA found out that at least 14 US cities could be flooded over the next century due to rising tides. As an answer to these issues, the Top City concept doesn’t involve a single skyscraper design project: it actually works like a grafting urban system. Responding to the needs of future flooded cities, it structures itself through an inverted hierarchy of function and distribution. Ground floor activities are simply shifted to highest floor levels, switching the settlement of the traditional skyscraper typology. The new building appears as a construction site that can be gradually updated according to changing climate conditions. 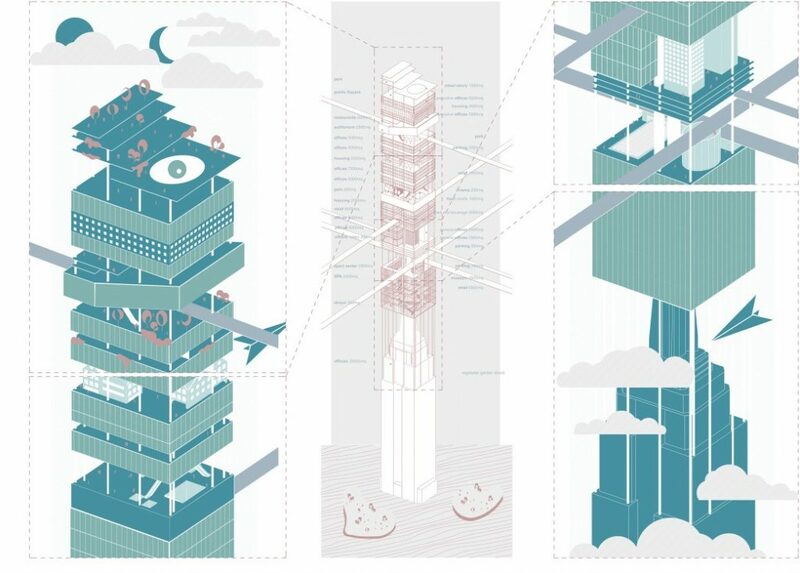 The grafting structure in based upon the reuse of the underlying building’s elevator system: the elevator, fundamental element of the skyscraper typology, acquires a more fluid nature, moving in every possible direction (not only up and down, but also left, right and diagonally). The streets are set up in order to create a structural net, aiming to connect buildings between each other in a faster way and to give strength to the new high rise urban arrangement. The skyscraper starts its growth including the pre-existing buildings, intensifying their typical evolution in height: the tip of the Empire State Building can now be experienced from a different point of view. 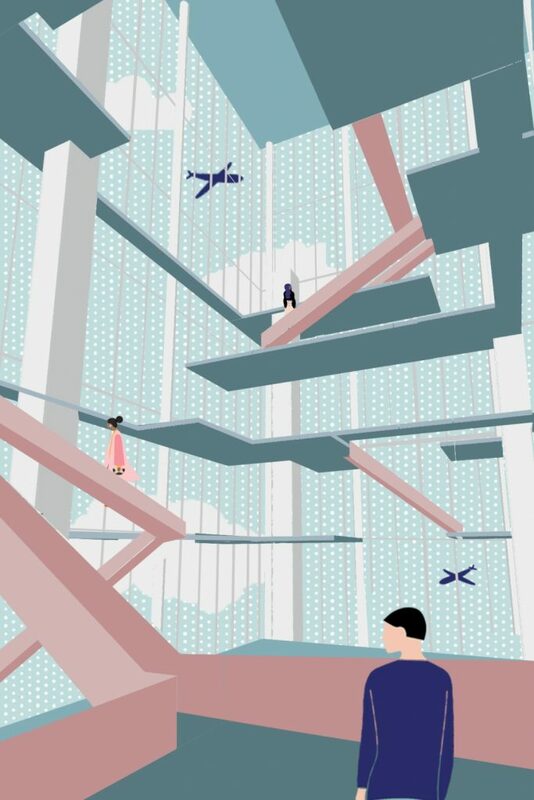 The skyscraper of the future doesn’t refer just to an architectural type, but materializes itself in the Top City, representing a realistic approach to future cities problems using a surrealistic language. In the current era, the Internet is a bombardment of information, even in architecture and in the graphics field there are expressive tendencies that arise and weaken, like a continuous flow. Today many architects represent projects with extreme photorealism, while many of them remain faithful to illustration, collage, and comics, graphic styles with great freedom of interpretation as a mean to perceive spaces. 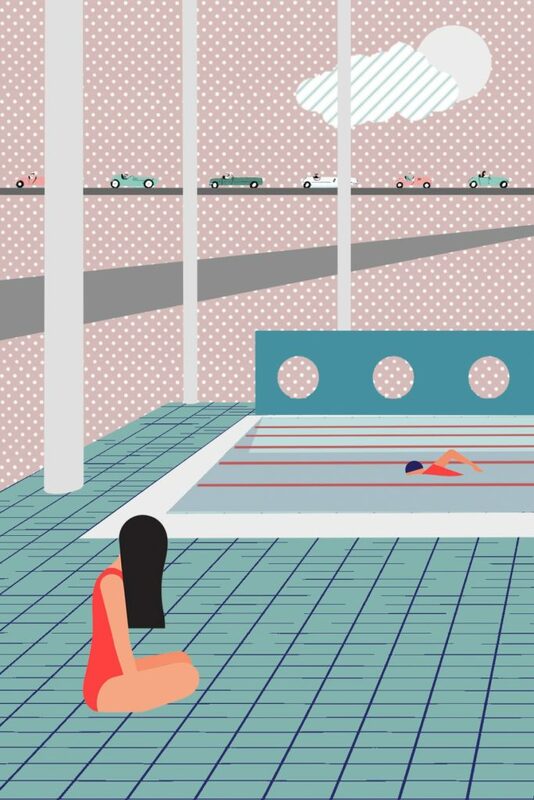 FALA Atelier, KYM Studio, DRDH, and many others are brilliant in representing projects through the collage style, creating a more direct dialogue with the public with their drawings. Moreover, the production of the Italian Superstudio always remains a great inspiration, not only for the pungent messages they were able to express in the architectural field, but also for their ability to deal with the public. What was your work process in terms of research? What case studies, books did you look to? A fundamental book that inspired our design process was, beyond any doubt, Delirious New York, published by Rem Koolhaas in 1978. 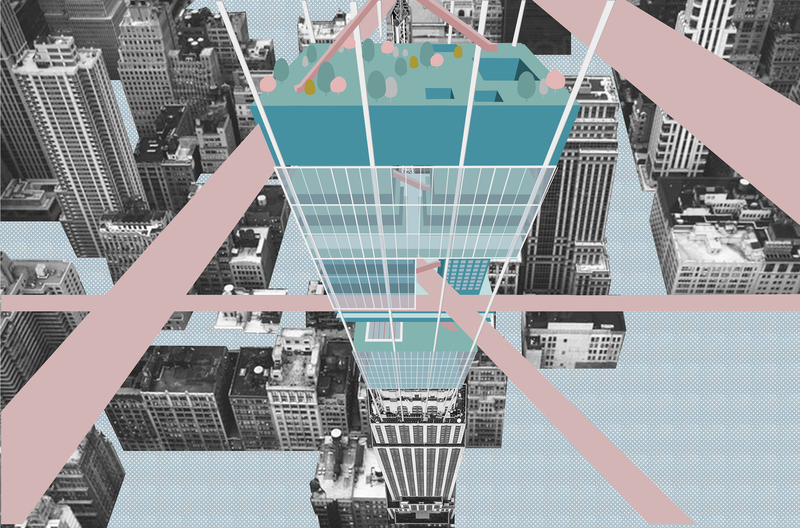 The concept, in fact, starts analysing the typology of the skyscraper and of its mayor characteristics, with a sort of “revolution” of the most representative element of this type: the elevator. It is implemented and developed in order to become the basic module that constructs the infrastructural system, giving birth to multi-directional pathways. 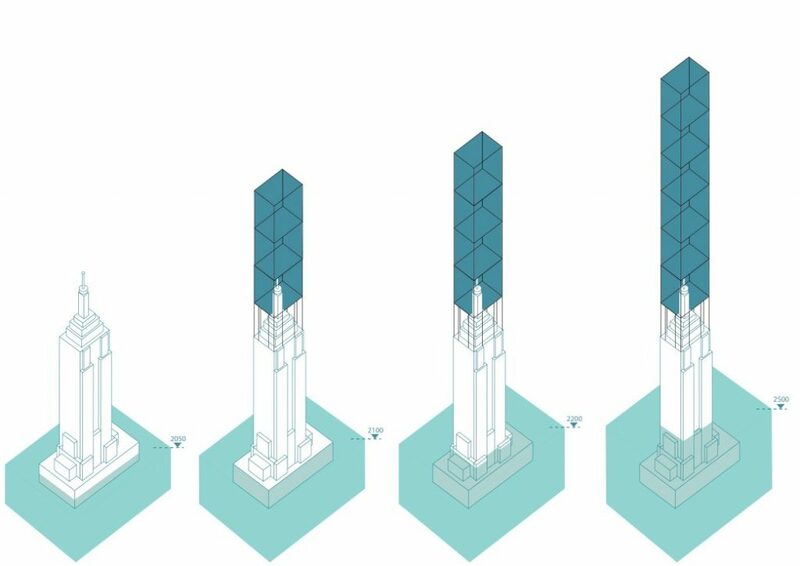 Our design would also like to evoke the idea of the skyscraper as a “living entity”, which is graphically displayed as something alive and distinguished by an effective identity. Regarding the graphical representation, it might seem reductive to reduce the list to a few bibliographical references, however, we feel like pointing out a cornerstone of the topic, that is Collage and Architecture by Jennifer A.E. Shields, an extraordinary insight into the appropriation and re-invention of new collage practices by architects to reach their aesthetic, experiential, and social goals. What dictated the selection of drawings through which you discuss your project? How important is the collage when compared to the views and the various plans? Collage has been chosen to simplify, and so clarify the spaces set-up, the complex system of internal distribution and the connection within the setting of a new top-city. The collage represents an immediate way to communicate the concept, before the choice of materials, textures and details. It can tell a story that gives the reader complete freedom to make it his own, unlike renderings or photorealistic images, where the story is clear and “un-interpretable”. It was useful for Top City project because it does not concerned a specific skyscraper project, but it supposed a future scenario for skyscrapers. What role did the axonometric play? How important was it when talking about the inversion of this typology? Among the various ways of representing an idea, axonometric merges simplicity to visual communication. The information is schematized and communicated by using a simple language; as a result of this process, the spatial organization is clear and immediate. The climate changes are affecting the way of living buildings and the means of transport: this dystopic future is represented abstractly. Considering the challenges and the way we decided to face them, we represented the project by using axonometric and views without materials and textures but just colours and patterns. This choice is directly related to our design purposes; it allows us to underline easily the concept of overlapping and inversion of spatial organization. If developing this architectural intervention further, where would this take you? We considered Top City more as a complex system than as a project of a single building, so probably the idea of the “inverted skyscraper” arose from a deeper transformation in the transportation context of the big city: probably the architectural object will continue to change according to the innovations in the transport field. In the future, we imagine the elevator evolves towards the streets, creating an hybrid way of movement that ranges from cable way to drones, not only for the transport of people, but for the exchange of goods too. This kind of view allows a more free distribution of functions and volumes in the skyscraper structure, where they can be mixed in many different ways still keeping fluid connections among each others. Could you explain a bit better the mixing of the spa and the museum or the transport hub and sports centre? The storeys of the building are bound to grow in an irregular way. That is the reason why, following the future needs of citizen, some spaces will become useless and abandoned, especially the first built volumes corresponding to the base of the new skyscraper and to connection with the underlying pre-existence. In the case of the atrium, a multi-storey space constructed around the current observatory of the Empire State Building, we thought of possible transformation in a museum of the history of the old and new building, due to its focal position in the middle of these two entities. 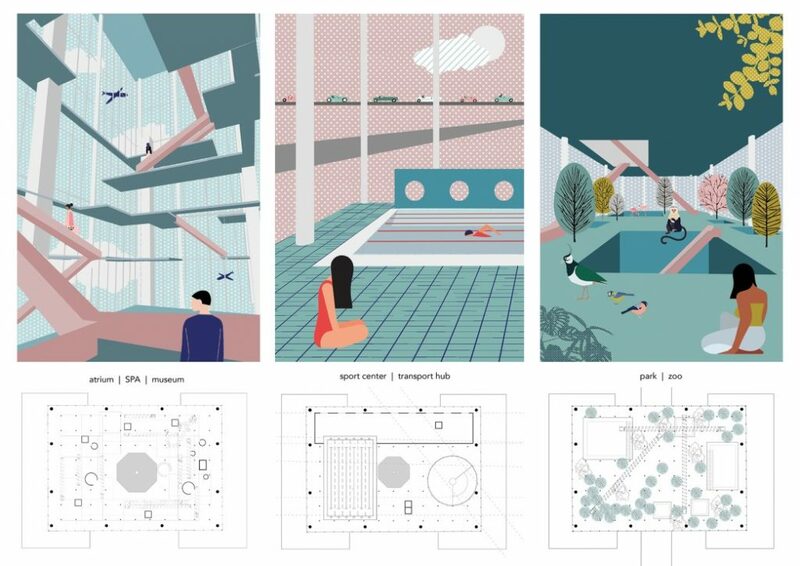 But the history of the building will probably grow together with its height: so we imagined a post-post-function for this place, that could become a SPA, a place where people could rest, deep under the part of the city they are used to live in that particular year or century. For the same reasons, we decided to incorporate (almost in every storey) a differentiated infrastructural path, adapted to the flow of various means of transport together (cars, bikes, trains, drones, airships and even airplanes). This is what happens with the sports centre level, that we identified as one of the most congested.